Depending on what you believe, the Universe began with a bang or was summoned into existence by some great force, or perhaps both or neither. But it did have a beginning. How can I be so certain? Well, there are two very convincing arguments that leave little doubt that universe (at least the one we know) must have had a beginning. The first is a simple application of the Second Law of Thermodynamics, which states that entropy must always increase. Technically this means that the possible energy states that a system can occupy always increases. But a more simple explanation is that the total amount of disorder increases. If the universe is eternal and had no beginning then it has certainly had enough time (forever seems sufficiently long) to have reached a state of complete disorder. However, this is not the case. The universe is observed to have a great deal of order. Stars have structure, and they conglomerate into larger structures which we call galaxies. Galaxies cluster into more immense structures and there are even superclusters of galaxies observed in the universe. Additionally human beings are very ordered systems; in an eternal universe we could not live to ask these questions. Still not convinced? Then consider another simple argument. In an eternal and static universe every line of sight would end on the surface of a star. Every photon of light emitted in the universe would find its way to everywhere else in the universe, over the span of forever. This would make the night sky as bright as the surface of the sun. Again this is clearly not the case. Thus, the universe had a beginning. But did time also have a beginning? In the current cosmological view of the universe time and space are linked together in a continuum, the spacetime continuum. The spacetime of our universe is currently being observed to expand. This effect was first seen by Astronomer Edwin Hubble in the 1920's. No matter which direction one looks, one will see distant galaxies moving away from us and each other. The current theory of the universe's beginning is known as the Big Bang. If all of the galaxies are now moving apart from each other in a uniform way then at some point in the past they must have all been in the same place. The densities and energies of the moment of creation were so great that no current theory of physics can describe what the universe must have been like at that singular point, called a singularity for obvious reasons. An explosion started the universe in motion as long as 20 billion years ago. At that moment of creation the spacetime continuum began, consisting of the spatial dimensions and a temporal dimension. So it would seem that time also had a beginning. But what is time? Everyone talks about it, everyone feels that they can sense its passing, and there are also those who talk about traveling through it. We of course all travel through time at rate of 60 seconds per minute and 60 minutes per hour and 24 hours per day and 365 days per year. What I am speaking of is the kind of travel that has only been a realm of science fiction for over 100 years, but in the last 10 years has become a theoretical possibilty. I mean traveling to the past to see events long gone or jumping to the distant future to see the progress of humanity. Who hasn't thought of returning to the past to relive a sweet moment or jumping ahead to learn what the outcome of an important decision might be? Until recently that was only possible in the imagination. Now it seems that modern physics holds yet more surprises. I hope to lead the reader through a discussion of the nature of time and space and then to show the physics involved in creating a time machine. Then I shall discuss the rather outrageous consequences that time travel holds for the nature of the universe. At the end we may be lost in a whirl of paradoxes, equations, and parallel universes, but the journey should be fun. Time is a very curious thing. Ask anyone on the street if they know what time is, they are sure to answer positively. But then ask them to explain it to you and they will most certainly be at a loss. People often talk about time with a negative connotation, because in some way it is linked to our own mortality. A favorite quote of mine about time is from the science fiction movie Star Trek: Generations (Indeed many science fiction stories often turn a good phrase about time) ``Time is the fire in which we burn'' also there is the famous quote from the great 19th century composer Hector Berlioz. ``Time is a great teacher, but unfortunately it kills all its pupils.'' We have a belief that time exists independent of us, but is it perhaps only something that is measured by our minds' and bodies' perceptions? We seem to have biological clocks that work on a set schedule. Anyone who has flown across several time zones and experienced jet lag knows this to be true. Time also seems to vary with culture. In the language of the Navaho there is no past, present, and future tense like those of many languages. Events are talked about with regard to their quality of happening rather than their temporal quality. Is it possible that time may not really exist, but is just an artifact of our biological and cultural evolution? Let us look at what has been historically determined about the nature of time. When it first became important for people to measure time they didn't have fancy wrist watches made in Switzerland. They needed to know when the winter was coming or when they could harvest fruit. For this they used the regular cycles of their environment. It was known to them that the Sun rises and sets in a regular and predictable manner. It was also known that the Moon, Stars, and Planets have cyclic motion through the heavens. They kept track of the passing of a day with sundials and the like. With this knowledge, the ancient peoples of Earth could predict the coming of the different seasons. There were many ancient peoples that devised very accurate calendars to keep track of time. The megalithic stones of Stonehenge in Great Britain are an example of such a calendar. The Mayans of Central America had a calendar based on the sidereal year that was at least as accurate as the calendars of today. Of course, these early measurements of time were based on the periodic motion of the Earth about its rotation axis and around the Sun. It is now known that these motions are not constant but vary in time. As history progressed methods of measuring time's passage became more focused on very regular oscillations of such things as springs and pendulums. Today official time is measured by atomic oscillations of cesium to an accuracy of parts per billion. What is it that clocks are measuring? They seem to measure some unseen medium that continues on at a constant and unyielding pace. Time is often thought of as a river that flows in one direction and slows for no one, it sweeps us along with it. Is there any evidence that it is really there or is it much like the ether that was once thought to permeate the universe. Certainly we experience time's passing. People are born, live, and die and feel as though they are constantly being pushed or dragged by this unseen phenomenon. Therefore, time must exist, right? Perhaps. But consider that time is something that we perceive through our senses, which are not perfect. Is it possible that how we think about time is related to how our brains processes information? In Book XI of Confessions of St. Augustine the illustrious St. Augustine discusses the nature of time and how God and free will fit in. I do not want to discuss theological implications of time here, though there is much that could be said on the matter. However, some of his thoughts on time are very insightful and I will attempt to explain them. First, let us consider how people often speak of time periods as having duration. For instance I might say I believed a road trip to take a very long time. But how is it that I can justify saying that a past or future time is long. I might say that a past time was long or a future time will be long. However, if the past is no more and the future is yet to occur then how could its duration be measured? Indeed, if the past no longer exists and the future is yet to exist then all that remains is the present. But the present has no duration. One can divide any period of time into a past and future, from millenia to picoseconds. The present is nothing more than a fleeting moment through which the future passes to become the past. So we are left with quite a conundrum, the past and future do not exist and the present has no duration, how can time be measured. St. Augustine proposed that time is measured in the mind. It is not an event itself that is measured but the impression that it leaves on the mind. The mind expects the future, which becomes the present, which the mind attends, and then becomes the past, which the mind remembers. The future and past do not exist, but in the mind there is expectation of the future and remembrance of the past. The present has no duration and still the mind's attention persists. So it is not the future which is long but a long expectation of the future. Likewise, it is not the past that was long but a long remembrance of the past. St. Augustine ended his discussion of time with the conclusion that it is something measured in the mind, a human conception. This is all the further one can go based on logic alone. So let us now turn to the realm of physics and discover what might be learned about the nature of time there. As you can see there is no variation in time as measured by the moving or stationary observer. In Newton's universe we live in a 3- dimensional world where three dimensions are spatial, and we have complete freedom to move within them. Additionally, there is a parameter of time, but in this parameter we are confined to motion in only one direction and at one constant rate. One of the consequences of Maxwell's equations of electro-magnetics is that the speed of a light wave is independent of the reference frame it is observed in. This is in direct violation of the Galilean Transformation rules. In the Galilean system if an observer in frame S', moving with velocity v, sends out a light signal, with velocity c, in the direction of travel then the velocity of the light wave as measured by a stationary observer in frame S, c', is c' = v + c. But that is not what Maxwell's equations say. They say that the velocity of light is c no matter what the frame observed in. So observers in S and S' measure c for the velocity of the same light wave. This is where the breakdown begins. This effect has now been measured in laboratories and has been confirmed the world over. The velocity of light is c (300,000,000 m/s) in every reference frame. This is one of the foundations of the theory of special relativity. Einstein recognized the physical significance of this transformation and thus formulated the special theory. The transformations now show that time is not the immutable dimension we thought it was. Later I will discuss the time travel opportunities present in this theory. However, it is important to note that in the Lorentz transformation there seems to be a mixture of space and time coordinates. It was at this point that people began to realize that time and space were not the separate entities that they appeared to be. They are somehow bound together in a 4-dimensional spacetime continuum. In this metric there are two different times. First is of course the coordinate time, the time measured by 2 stationary observers to the coordinate system. Second is the proper time, the time measured by a lone observer whom measures their own motion to be zero. The proper time is found by simply dividing the distance in the spacetime by a velocity, the speed of light. The proper time and the coordinate time are related by the metric equation. This relation will help us travel in time, but we shall come back to that shortly. The most important of these principles to our discussion is (4). It states that the shape, and thereby the metric equation, of spacetime is determined by matter content of the spacetime. Simply put, matter warps spacetime through its gravity. This can be visualized in what is known as an embedding diagram (figure 1). In the diagram the four dimensions of spacetime are reduced to a two dimensional sheet. If you imagine this sheet as being made of rubber and stretched taut then any mass, say a marble, placed on the sheet will warp it. This warping effect will cause gravity to bend and focus light like a lens. This effect has been observed during solar eclipses. When the sun's photosphere is blocked by the moon, background stars are visible. The stars' apparent positions are shifted near the sun from their positions when the sun is not in the field. There have been many experimental verifications of general relativity over the past 70 years and the theory is now generally accepted. This is very promising for us aspiring time travelers as not only will general relativity allow us to visit the future but we may also be able to journey to the past. We have seen that velocity and gravity warp spacetime in ways that cause time to be relative to the observer measuring it. Let us now investigate the various modes by which time travel can be accomplished and what consequences that has for the nature of the universe. Travel to the future is a relatively easy process, at least compared to backwards time travel. We shall see that the most basic results of special and general relativity will allow us to make a trek to the future. But beware, before we set off to see our grandchildren and great-grandchildren we should be aware that getting back to our own time is not an easy affair and may not be possible at all. If you recall, special relativity had an expression for the relationship between proper time, Tau, and the coordinate time, t. Let us now examine that relation. As you can already see the time interval that the a stationary observer measures for the moving observer is dependent on the relative velocity, v. Imagine that two stationary observers are on Earth, lets name them Jennifer and Jan. Then imagine a moving observer, Bob, is aboard a space ship flying away from Earth. Any time period on Bob's ship will be measured by Jennifer and Jan to be longer than Bob will measure it. This effect grows larger as Bob's velocity increases. This is known as time dilation. The dilation grows until a critical velocity is reached, the velocity of light. At the speed of light any event that occurs on Bob's ship will appear to take forever to Jennifer and Jan. If Bob's velocity exceeds c the time dilation factor becomes imaginary and Bob would actually be moving backward in time. However, there are other constraints that limit Bob from reaching c. As v increases mass also increases by the relation . So Bob's mass would become infinite at c. Also it would take an infinite amount of energy to accelerate Bob to c. So Bob, and any other particle with mass, may get arbitrarily close to c but may never reach or exceed it. There is one loophole in the equations that does allow things to be traveling faster than c. If such a particle existed it would have to have been created moving faster than c and it could never travel at c or slower. Such theoretical particles are called tachyons and would travel backward in time. But Bob is not a tachyon so there's no hope there. But Bob has indeed become a time traveler. Suppose that Bob reached a speed of .99c at some point and maintained it for 5 years and then decelerated, which is not so easy to do since Bob has a gigantic momentum. Bob then decides that he is just way too far from home so he heads back to Earth to visit Jennifer and Jan. Again he reaches .99c and maintains it for 5 years. 10 long years have passed for Bob on that space ship but he looks forward to seeing his friends Jennifer and Jan. When he sees them he finds that they are very old women now. 70 years have passed on Earth since Bob's departure. Bob has made a trip to the future. Can Bob get back to the time he left? We'll find out in good time. There is another relatively easy way to journey to the future utilizing general relativity. If you recall, we saw that the spacetime metric equation was dependent on the matter content in that spacetime region. The German physicist Karl Schwarzschild was the first to work out a solution for the spacetime surrounding a static spherical mass. This is the metric he derived, and it bears his name. The form of this time dilation formula is nearly the same as that for the special relativistic case. The critical parameter now is the radial distance, r, from the mass, M. A person very far from the surface of the mass will measure a different time than a person close to the mass. Indeed this effect has been measured on Earth. Atomic clocks placed in a basement of a very tall sky scraper ran slower than clocks on the top floor by billionths of a second. In order to get significant time travel effects from this we need a stronger gravitational field. There is a critical radius in the Schwarzschild metric like the critical velocity of the previous example. It occurs at r = 2GM/c^2, this is known as the Schwarzschild radius. This is a radius where, if all of the mass of the object were squeezed interior to, would cause the object to become a black hole. At the Schwarzschild radius the escape velocity is the speed of light. Anything crossing the Schwarzschild radius becomes trapped within. For the Earth the Schwarzschild radius is 9 millimeters. That is this big ----. Now if I were to get as close as 0.007 mm from Schwarzschild radius and just sit there for 2 years and I asked you to watch me from very far away you would have to watch me for 70 years. I have ignored the fact that at that distance the gravitational field would be so strong that it could pull me apart from head to toe, but I've got my inertial dampeners from Star Trek with me so I'm okay. Then if I moved away from the now diminished Earth I would find that you are 68 years older than I expected you to be. Like Bob, I have traveled to the future. But I've decided that I don't like the future as much as I thought I would. Is there any hope of my returning to the past? Yes, there is hope, but the return trip is likely to be difficult. Backwards time travel is theoretically possible by several different methods using general relativity. However, each of these methods has its own peculiar problems that could destroy the time machine before it has a chance to operate. Perhaps we can find one time machine among the lot which holds the most promise of taking us to the past. As I mentioned before a black hole is an object that has all of its mass within its Schwarzschild radius. For densities that high the gravitational force overwhelms degenerate electron and degenerate neutron pressures. Beyond this there are no known pressures that could support the matter against the force of gravity. Gravity crushes all of the mass into a point, called a singularity, of infinite density. The spacetime curvature inside the Schwarzschild radius is infinite (see figure 2). The surface at the Schwarzschild radius is called the event horizon. Crossing the event horizon is saying goodbye to that region of spacetime forever. The possibility of backward time travel is due to the possibility that the black hole may empty out into another region of spacetime. Another region of space and another time, possibly the past. The Schwarzschild metric is for spherical, non-rotating, static mass distributions. A black hole is believed to be a possible end point in the life of a very massive star. All stars that are observed in our universe are observed to be rotating, and that rotation tends to cause their shape to deviate from spherical. So the Schwarzschild black hole is not an object that would tend to occur in nature. If we assume that a very advanced society is capable of constructing one could it be used for a time machine? Probably not. Consider a would-be black hole explorer, Chris. We decide to watch Chris enter the black hole from a fair distance. As Chris gets closer to the black hole the gravitational field becomes quite intense. We observe the clock that Chris holds by light signals that it emits and see that it appears to run slower and slower. Eventually, the gravitational differential from head toe becomes so great that it should literally pull Chris apart. That's if the black hole mass is small, say 1 solar mass. Paradoxically, supermassive black holes would have much less intense tidal forces near the event horizon. But we will assume that we are sufficiently advanced such that we can build a space suit capable of withstanding the tidal forces and keeping Chris alive through this adventure. Because of the time dilation effects at a black hole's surface light waves will appear to change color, they will be red-shifted. The light from Chris' clock will shift out of the visual wavelengths into the infrared and then into the radio and eventually out of our detection ability. We can no longer observe the adventure. It is just as well, because if we could detect Chris all the way to the event horizon we would have to watch forever (I don't think I'll live that long). Time dilates to infinity at the event horizon, as seen by an observer from an infinite distance. So to continue the narrative we must move to Chris' frame. Upon crossing the event horizon we will notice nothing special whatsoever. But we can no longer turn back. Now our folly is fully realized. We see the singularity and realize that if the black hole does deposit material somewhere else in spacetime it must pass through it and that will undoubtedly be fatal. This is where our story must end. If only it had been a rotating black hole. If the black hole that we followed Chris into had been a rotating black hole then it would have been described not by the Schwarzschild metric but instead by the Kerr metric. I will not clutter the page with its mathematical form because it would take far too much explaining to get to a simple result. The critical change that occurs in the black hole, besides its shape and number of surfaces to pass through, is that now the singularity can be avoided. Some think that black holes may dump their matter into another spacetime region through objects called white holes. They would be the exact opposite of black holes. Instead of having an event horizon there would be an anti-event horizon through which matter can only leave but never enter. Black holes have never been directly observed, as that would be all but impossible. There is observational evidence for their existence by their gravitational influences on nearby objects. However, no one has ever observed an object that could be a white hole, so their existence must be called into question. If they do exist it is possible that they do not empty into our universe but rather into another universe altogether. There are still some problems with this time-machine. If a white hole did exist the anti-event horizon would be very unstable. A single photon of light that fell upon it would grow more blue-shifted and gain so much energy that it would convert the anti-event horizon into a regular event horizon within a fraction of a second of the white hole's creation. This would trap us inside yet another event horizon before we ever had a chance to escape through the white hole. There are additional arguments to show that a black hole would not be traversable. But I think it has become obvious that black holes are a lost cause as far a making time machines is concerned. There have been other time travel mechanisms that have been conceived that allow backward time travel. But in most cases there is a physical reason that these objects would be excluded from existence in our universe. For instance there are schemes where we have a spinning universe, known as Gödel's Universe, after Kurt Gödel who first conceived of it. In this scheme closed time-like curves would exist where you could travel in a circle in spacetime and return to a point in spacetime that you have already been, thereby meeting yourself. However our universe is not believed to be spinning so this situation is considered unphysical. There is a new time travel scheme put forward by J.R. Gott where one could build a time machine by moving two cosmic strings parallel and relative to one another. Cosmic strings are theoretical remnants of the Big Bang which would be extremely long and thin and have nearly infinite density. Almost like a line singularity. The relative motion of the two strings and the geometry of spacetime about them would allow for closed time-like curves. Unfortunately, Stephen Hawking showed that unless gigantic amounts of matter having negative energy were used to surround this system it would become a black hole. So our search for a time machine continues. Is there any hope of our building a time machine that the universe won't destroy before we can use it to travel back in time? Yes, there is hope in the form of wormholes. Theories of wormholes predate black holes. Within a year of Einstein's final publishing of the general theory of relativity physicist Ludwig Flamm recognized that Schwarzschild`s solution represented a wormhole. A wormhole is a tunnel through hyperspace to another region of spacetime in our universe or perhaps another (see figure 3). The wormhole consists of two mouths that are spherically symmetric and a throat that has a maximum radius equal to its Schwarzschild radius. There are two kinds of wormholes, those that will be useful to us aspiring time travelers and those that will not. If Schwarzschild wormholes exist in nature they are not likely to be very useful to us as time machines or means of rapid interstellar travel. Firstly, the wormhole would have tidal forces in the throat that are comparable to those at the event horizon of a Schwarzschild black hole. Theses forces would be fatal to us. Secondly the wormhole is not static, it evolves with time. It begins as two disconnected spacetimes with a throat radius of zero. The throat radius then expands to some maximum and the spacetimes meet. The radius then begins to contract and the spacetimes disconnect once again. This expansion and recontraction is so rapid that even traveling at the speed of light would not see us through before we were caught by the crunch of the tidal forces during recontraction, which would certainly annihilate us. Lastly, Schwarzschild wormholes possess anti-event horizons which would be unstable to perturbations just as those in white holes. This would hasten the recontraction phase of the wormhole's evolution making travel through it that much more impossible. So Schwarzschild wormholes are not of any use to us, but there are solutions to the Einstein field equations that are. 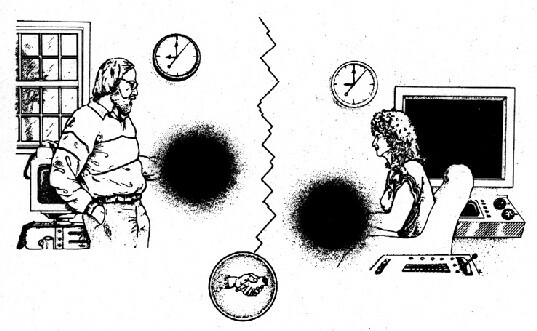 Professor Kip Thorne, of the California Institute of Technology, was stimulated, in the summer of 1985, to search for alternate wormhole solutions that would allow safe passage for interstellar travelers. His motivation was a request for help from his friend and colleague, Carl Sagan. Professor Sagan was writing a science fiction story (The novel was entitled Contact which has been made into a motion picture staring Jodi Foster as the heroine) in which his heroine needed to cross a great interstellar distance in a very short time, namely the distance between Earth and the star Vega (see figure 3). Professor Thorne was only too happy to oblige. He found a solution which was so simple that he was surprised no one had found it before. The solution has the following metric equation. Where b(r) determines the spatial shape of the wormhole, and Phi(r) determines the gravitational redshift. This solution has the property of having no horizons or excessive tidal forces to deal with which makes it safe for humans to travel through. But it does have one unfortunate drawback. In order to hold the throat open there has to be a negative energy density inside. There is no no known material that has this property. Though electro-magnetic vacuum fluctuations are sometimes measured to have negative energy densities and are correspondingly called ``exotic''. In order to keep the wormhole open it needs to be threaded with exotic matter that will create a tension to push the walls apart. This exotic matter would have the curious effect of defocusing light as it passed through (see figure 4). Assuming that this exotic matter can be discovered or manufactured how would one go about constructing such a wormhole? Certainly objects such as these do not occur naturally. The answer may lie in quantum mechanics. On a sufficiently small scale the universe is probabilistic. Refer to figure 5 to see possible geometries at the quantum level. This network of wormholes and black holes is known as the quantum foam. There are certain probabilities that wormholes will pop in and out of existence at this level. If we assume that we, or some other society, are sufficiently advanced that we can observe this quantum foam and manufacture exotic matter, then it might be possible to reach into this microscopic universe and capture a wormhole. By pouring exotic matter into it we might be able to blow it up to a macroscopic size. We would then be poised to embark on the greatest journey imaginable. With the idea of a traversable wormhole now established as a possibility, given the existence of exotic matter, there now exists the possibility of creating a time machine. In his book, Black Holes and Time Warps, Kip Thorne explains how he and his wife can conspire to make a time machine from a single wormhole. He first asks us to assume that we are a sufficiently advanced society such that we can create and manipulate wormholes. Or at least that such a society exists and has made us such a wormhole. This established, he then assumes that he has a small wormhole through hyperspace with a tunnel of say half-a-meter in length. He has both mouths of the wormhole in his living room and time is connected through the wormhole such that if he sticks his hand in one mouth it will instantly appear coming out of the other mouth across the room. His wife, Carolee, now takes one mouth with her into the family space ship and Kip remains in the living room with the other mouth. They hold hands through the wormhole (see figure 6) and Carolee takes off with the space ship. She accelerates to relativistic speeds and goes off into space for 6 hours. All the while she and Kip can look through the wormhole and see each other. After 6 hours she turns the ship around and heads back to Earth which takes another 6 hours. After 12 hours have passed Kip will look through the wormhole still holding hands with Carolee and see that she has landed and is now out in the front yard. So he will let go and start toward the door to go out and greet her when he notices that she is not out there yet. The relativistic speeds and accelerations that she has encountered have dilated her time so that in Kip's view she is still out in space on her journey holding hands with him. So Kip waits for her arrival...he waits 10 years. When she finally arrives he goes out to greet her. He opens the door of the craft and finds her not having aged more than 12 hours since her departure with her hand still in the wormhole. He looks into the wormhole and sees himself 10 years ago holding hands with Carolee. The wormhole is now a time machine! Kip can step through the wormhole and go back as far as 10 years, to the creation of the time machine but not any earlier. The Kip on the other end can also step through the wormhole and come forward 10 years. H.G. Wells eat your heart out! When Kip Thorne first realized that such a situation was possible he wondered if some physical process could destroy his wormhole before it became a time machine. The first thing to occur to him was that when the wormhole became a time machine electro-magnetic waves could propagate through it and interfere with themselves. They could interfere in such a way as to cause constructive interference and thereby strengthen their amplitude. This could continue until there was a beam of radiation between the two mouths of the wormhole that was powerful enough to destroy it. But alas the time machine is saved by that strange exotic matter. As was mentioned before, the tension inside the wormhole would defocus any electro-magnetic waves passing through it (Figure 4). It turns out that this defocusing is just enough so as to stop the radiation beam from getting strong enough to destroy the time machine. However there is another effect that could have the strength to destroy it. That is the electro-magnetic vacuum fluctuations. These fluctuations are quantum mechanical in nature and have behavior such that they could pile up on themselves in a similar manner as described with the E-M waves. They would be defocused by the wormhole but their quantum mechanical nature could allow them to refocus and continue their pile up. Whether or not they could reach a strength great enough to destroy the wormhole is a matter of quantum gravity for which as yet there is no theory to describe. Thus there does remain doubt that the time machine can be constructed and used before it destroys itself. Only time will tell. It seems that time travel may be a real possibility, given that there exits exotic matter and a wormhole can be constructed. But there is another rather compelling reason that many people do not believe that time travel is possible. If time travel were possible paradoxes would be allowed to exist and that most cherished notion of causality could be violated. Some have speculated that the universe may have a law that prevents causality violation or paradox. Some, however, believe that maybe we cannot travel to our own past and cause paradox but we can travel to the past of a parallel universe. The idea of causality is that a cause must always precede its effect. This seems logical. But time travel would allow someone to travel back in time to a point before they were born. How can someone live before they were born? This point seems subtle but I do not think that it is a strong argument. If I can go back in time to meet a younger version of myself, why can't I go back before I even existed. The laws of physics do not state anywhere that moving at different rates in time should affect my biology in any way. In fact, from a relativistic point of view, it is perfectly valid for me to seem to experience the normal flow of time while the outside world changes. Even though I may step through a wormhole that has its other mouth 33 years in the past I should still remain the same age that I am when I step through the wormhole. I would then appear in the past, a person of approximately 23 years old. There is no physical reason why I could not live 10 years before I was born. The real trouble happens if I do something to prevent my time travel in the future, which is my past. There are some rather standard time travel paradoxes that are often presented. They usually involve the killing of an ancestor in the past in order to prevent the time traveler's own birth. However, I find no reason to be so morbid. There are many mind bending scenarios that can be invoked to illustrate the problem of paradox. Let us imagine that I have discovered a wormhole time machine created by some ancient race of spacetime explorers and can travel to the past and back to the present. Now suppose that I decide that I want to change history. I want to go back to Dallas, Texas on November 22, 1963 and prevent President Kennedy from being assassinated. I go back in time and I manage to warn the proper authorities of the danger to the President. They catch Lee Harvey Oswald and any conspirators before they are able to accomplish their deadly mission. I am successful and the assassination is averted. Now all of the history books change. When I go to school and take history there will be no mention of the assassination of President Kennedy, because it never happened. That being the case, when I find my time machine and decide to step back in time and change history I will not go back to prevent his murder. Since I do not go back to stop the assassination it will occur again, and by now the paradox is obvious. So while I may have started off with good intentions, saving a life, I end up creating an irreconcilable paradox. Are there any ways out of this paradox or have I doomed the spacetime continuum to destruction? There are those who believe that because of paradoxes time travel is impossible. Dr. Stephen Hawking of Cambridge found himself amongst those people. In fact, he formulated what he called the Chronology Protection Conjecture. It simply states that the universe will protect itself from time paradox by not allowing time machines to be made. The way the universe would accomplish this is through a variety of means. For instance, the universe might stop Kip Thorne and his wife from making a time machine out of a wormhole by destroying the wormhole with electro-magnetic vacuum fluctuations that feed back on themselves through the wormhole. Makers of cosmic string time machines would be cut-off from their time machines before they could use them by singularities or horizons. It seems to me that this conjecture is rather contrived. In the known physical cases of Closed Timelike Curves there are problems with horizons and singularities, but that does not necessarily mean that no time machine can ever be invented. It should be noted that Stephen Hawking has since changed his mind and decided that Kip Thorne's wormhole time machine might be possible if parallel universes exist. There is another possibility when it comes to the universe protecting itself from paradox and it is nothing less than predestination. Consider the story of a woman who grew up in a time of war. As a young girl she was trained as a soldier and fought in many battles. In one particular battle she was injured by a gunshot to the shoulder. This forever caused her to have bad aim. One day in the future she joins a militant group that believes that the ideals of the past were wrong and they must return to the past to try and change the outcome of an important battle. The battle does not seem to go well for the future soldiers fighting the past soldiers. No matter what they do they cannot gain an advantage, and they retreat. As the woman is retreating she sees a young girl taking aim at the leader of her group. She fires at the girl hoping to hit her square in the head, but she misses. She strikes the young girl in the shoulder instead. It is then that she realizes that the young girl was her. Had she fired true she would have killed herself and created a paradox, but she could not fire true for she had bad aim due to the injury that she received from herself. In this scenario there is no paradox, but there is a disturbing ring of predestiny. The future caused the past. In fact the past required that the future already exist in order to avoid paradox. Finally, there is a scenario where an infinite loop of time, a mobius if you will, is created. Let us return to the scenario of my traveling to the past to try and avert the Kennedy assassination. We left me at the point where I was going to travel to the past to try and change history for the better. Another version of me has already done this once. He went back and stopped Kennedy from being assassinated. But what if that action did not have the consequences that I had hoped it would originally. What if by living President Kennedy becomes the cause of a nuclear war that devastates the Earth. Let us suppose that a version of me will be born in this dismal world lying in ruins. Let us also suppose that, like my alternate self, I come across a time machine and try to go back in time to change history. This time, what will I change? Because I know that Kennedy was the cause of the war that destroyed the human civilization I might now be inclined to go back in time and kill him before he has the chance. When would I do this, why November 22nd, 1963 of course, after all it seems that the time machine I have come across naturally has its other mouth in that time. I would become one of the conspirators that another version of myself will stop from committing this crime. In this way there are two histories which are co-existing and interacting with each other. The histories tie up in a loop that has no beginning or end, breaking the loop would be impossible because that would result in the paradox that we discussed before. The only other way to stop the loop would be to stop both versions of myself from time traveling, thereby never creating the loop. Now we come to the solution of the paradox problem that quantum mechanics predicts, parallel universes. In the quantum universe everything is probabilistic. The occurrence of an event is ruled by the probability of its happening. In quantum mechanics a particle has no definite position, energy, momentum or time. The Heisenberg Uncertainty principle, and , tells us that we can only measure these quantities within a certain accuracy and beyond that accuracy they are uncertain. This is not simply a technological issue of measurement but the actual nature of the universe. Beyond a certain point the universe is in a state of mixed probabilities. This is what the universe is like. Down to a limit we cannot look and the universe remains uncertain. There is an interpretation of this that says that all things that are possible to occur will occur in separate universes. These parallel universes would exist alongside each other in hyperspace with the universes of similar probability closer to each other. The universes very close to one another would differ by very little and those farther away by much more. There would be a constant creation of these universes as time progressed. The universes could connect to one another via wormholes or Kerr tunnels. As we have seen the wormhole and black hole solutions connect to regions of spacetime that are not necessarily in our own universe. Now let us look at one of our paradoxical time travel situations and see how parallel universes save the day. Let us return to the Kennedy assassination. Again I have found a time machine and decide to go back in time and stop the assassination from occurring. Once again I am successful in stopping it. Now I would like to return to my own time and witness the changes that have occurred. But I have just created a parallel universe. One which was identical to my own up until the moment that I arrived in the past. Until that moment the universes were one. But in my universe there was no me in 1963, so the act of placing myself in that time has already created a new universe that will undoubtedly be different. In this new universe I go forward in time, perhaps through special relativistic effects and find a future very different from the one I knew. I might also find another me, the one that was born in this universe in 1973. We would be different people as we have experienced different lives. But what if instead of going forward in time through relativistic effects I simply decided to step back through my wormhole, what would I find? I would find that nothing has changed. Kennedy is still dead and there is no other me, because the past I visited is not in this universe. When I stepped through the wormhole I disappeared from this universe into another. It is easy to see that If I were not careful I could get lost in parallel universes and never find my way back. Consider the scenario where I travel to the future of the new universe and meet my doppleganger. What if I don't like this universe at all, what if saving Kennedy leads to a nuclear war, can I go back to my original universe? No. I am now in another universe and I find a wormhole time machine with my counterpart. We decide to set it for November 22, 1963 and change things once again. But once again we create another parallel universe, this time there are 3 versions of me in 1963 and we all have different agendas. If parallel universes are real and some advanced society can create a stable wormhole and turn it into a time machine then time travel is certainly possible. The journeys that one could have in time would be quite an experience, to say the least. As our journey through time and space and other universes comes to a close let us reflect on what we have discovered. We asked what was the nature of time and whether or not it actually existed. Through logical argument we came to a conclusion that time was only something measured in the mind of us humans. But we also saw that time can be viewed as a physical dimension belonging to a spacetime continuum. Its reality seems quite firm in that sense. Experiment verifies the theories of relativity showing that time is not a universal constant but is relative to an observer. From logic we deduced that the past and future do not exist. But we discovered that it might be possible to travel in time. If we can visit the past or the future they must exist. Also if time travel is possible then it is likely that there are an infinite amount of universes that we can travel to preventing us from creating paradoxes. We also saw that there are closed solutions to paradoxes that require that the past and the future mutually coexist and cause one another. It is a dizzying array of possibilities to assimilate. Perhaps there really is no time and the dimension we call time is some parameter that depends upon our perceptions of it. Or perhaps time exists, but in a multidimensional continuum that our finite minds experience one event at a time. It's really a question of metaphysics, but cosmology was once a metaphysical study. As more knowledge was gained it became the science it is today, seeking to understand how the universe began and how it will end. Current evidence suggests that the universe began with a bang, but its fate remains unknown. Will time have an end? Maybe we should travel to the future and find out, that is if you are up for the trip. Let's meet...yesterday! Thorne, Kip S. and Morris, Michael S.. Wormholes in spacetime and their use for interstellar travel: A tool for teaching general relativity. Am. J. Phys. 56(6), May 1988. Thorne, Kip S.. Black Holes and Time Warps, Einstein's Outrageous Legacy. W.W. Norton & Company Inc., 1994. Macvey, John W.. Time Travel, A Guide to Journeys in the Fourth Dimension. Scarborough House/Publishers, 1990. Wolf, Fred Alan. Parallel Universes, The Search for Other Worlds. Touchstone Simon and Schuster, 1988. Halpern, Paul. Cosmic Wormholes, The Search for Interstellar Shortcuts. DUTTON, the Penguin Group, 1992. Hawking, Stephen. A Brief History of Time, From the Big Bang to Black Holes. Bantam, 1988. Novello, M., Svaiter, N.F., and Guimaraes,M.E.X.. Backwards Time-Travel Induced by Combined Magnetic and Gravitational Fields. Modern Physics Letters A, Vol. 7, No. 5 (1992) 381-386. Deser S.. Physical Obstacles to Time-Travel. Classical and Quantum Gravity 10 (1993) S67-S73. IOP Publishing Ltd., 1993. Antonsen Frank, and Bormann, Karsten. Problems in Time-Machine Construction due to Wormhole Evolution. International Journal of Theoretical Physics, Vol. 34, No. 10, 1995. Allen, Bruce and Simon, Jonathan. Time Travel on a String. Nature Vol. 357, 7 May 1992. Figures 3,4,5, and 6 are from Thorne, Kip S.. Black Holes and Time Warps, Einstein's Outrageous Legacy. W.W. Norton \& Company Inc., 1994. Figure 1 is from PBS online's Web Page about Einstein.